We talk about executive functioning so frequently because it affects everything that a child (or adult) does all day, every day. We have a few disclaimers that we would like you to know when it comes to executive functioning. The first is don’t get overwhelmed. We are going to continue to break down the topic and go further into it later down the road. Our second disclaimer is that this is our list of executive function (EF) traits and how we see our students impacted by their own executive functioning. For now, we will give an overview of all the elements of executive functioning that impact our ability to function in either a positive way (using good EF skills) or a negative way (lacking in EF skills). So what is executive function? Our definition of executive function is the ability to plan, manage, organize, and “do” your life. In other words, it is the ability to prioritize and execute. Executive functioning is not only linked to school but it can be linked to the concept of adulting, which children tend to learn about and work on as they go through school. For example, when a child is trying to memorize the periodic table of elements for a class, they are not necessarily memorizing the information because they are going into a science profession or because they are going to be using the elements for the rest of their lives. During their process of memorizing, they are working on building skills that they will continue to use throughout their lives. Therefore, it is not all about what the material is but rather about HOW you are approaching it. The processes students go through in school, such as turning in homework and studying for tests, can be related to the adult equivalent of those process, such as paying bills and going to work. Life is all about hoop jumping. If you have a good strategy for how you are going to approach the hoop jumping then you are going to do much better off long term. We have identified executive functioning as having seven major key points. 1. Organization, planning, and prioritizing: This means organizing your time and things, as well as deciding how to approach a task and in what order you are going to do things. Let’s look at how school is impacted in this key point. There are various things you need to know such as when there is a test, what needs to be studied for the test, reading all parts of an assignment as well as all parts of questions, getting assignments turned in, getting to your classes on time, managing multiple assignments simultaneously, homework: what is most important and what to start with, calendar, where your materials are, and even backpack organization. 2. Time: This involves time management and the ability to start a task, also referred to as task initiation. Getting the ball rolling can be very challenging for some students. A lot of parents will come to us and say, “My kid is lazy and they are a procrastinator.” This can be a trigger for us because children inherently want to please and do well–“laziness” is a result of something else. We re-frame the language and make it about task initiation rather than procrastination/laziness. The student is not putting off work because they know how to do it; they are putting it off because they do not know where to start. School is impacted by time management and task initiation because it impacts how you start anything. Students struggle with task initiation in all the aspects of an assignment; writing, staying on task, not getting distracted or their own ability to recognize that they are distracted, their ability to calendar, and how they manage non preferred tasks. 3. Memory: There are three different types of memory that you should know. There is short-term memory, working memory, and long-term memory. Overall, memory is really all about repeated exposure to the same ideas. Short-term and long-term memory are slightly more familiar to the general population. Short-term memory is really just remembering what you had for breakfast. It is not key information and it is not anything that you have to go back and revisit. There is no reason to store that information for two or three years from now. Long-term memory, on the flip side, is key information that you do want to keep stored. So what is working memory? Working memory is the information your brain takes in and holds onto for a while and what it chooses to get rid of versus what it chooses to keep and use. There is only so much space in your brain and kids tend to use the space for things like remembering the dates of homework or tests or what page and problems they have to do for math. This winds up taking up so much space that there is not much room left for actual information they’re going to be tested on. That is why we stress the importance of using a calendar and writing things down. We want the information in our students’ brains to be the information they are going to be tested on, not the dates of the tests themselves. 4. Motivation: The first type of motivation is intrinsic motivation which is the motivation from within. You are motivated to do well because you like the way that feels. The other type of motivation is extrinsic motivation which is when you are motivated by an outside force. An example of these forms of motivation could be two young siblings, a brother and a sister, taking piano lessons. The sister wants to do good because she genuinely enjoys music. She practices and applies herself because she is intrinsically motivated and she feels good when she accomplishes the task for the day. However, the brother who is also taking the same piano lessons does not like playing piano and does not want to practice. In order to get him to apply himself, he is told that if he has a good piano lesson then he will receive a new action figure. He is extrinsically motivated to apply himself to his piano lessons. We believe that all kids start out intrinsically motivated. They have a desire to please the adults in their lives. There is a reason that kids transition to becoming extrinsically motivated. Once a child goes through puberty and school has been hard, they emotionally disconnect because it does not help their self-esteem at all to place their self-worth on their grades. These kids try hard yet are not yielding the same results of their peers who don’t seem to be working as hard as them. Therefore, kids do actually make a transition as they go through puberty between being intrinsically motivated and becoming extrinsically motivated particularly if school is hard. 5. Managing stress: There are all types of stress we see for children in school. As adults we must realize the different levels of stress kids have such as fitting in with their peers, getting good grades, and doing what their parents want them to do. All of these things become all tied together. When it comes to the approach of managing stress it really depends on what the student is stressed about. Most of the time we find that managing procrastination and helping to support task initiation directly links to the level of stress. Another major component of managing stress is using a calendar. One of the ways that we personally manage stress is our tendency to GSD: Get Stuff Done. Something that can help to develop this tendency is to create a “Would be Nice” list where you write down everything that would be nice to do if you had the time. This can help you and push you to sift through everything you have to do throughout your day. The other aspect of this key point is understanding what the stress is about. Some of the time students can’t vocalize what it is that is causing their stress because they do not know. However, they really do know what they dread. Creating a routine, starting at the same time, doing all the subjects in the same order every day, knowing what you need to do and how you need to start and what order to go in is very informative for students. This then becomes a goal that they can achieve because they know what is expected and they can just follow that along and ultimately be successful. One of the major factors of stress for students is worrying that they will forget something. This is why having a certain order and framework is important so they can be more likely to remember. 6. Self-knowledge: This key point can also be called metacognition. Metacognition is your understanding of yourself at a higher level. It can also be referred to as demystification. When a student knows themselves, their strengths and their weaknesses, they are able to easily create a strategy for handling an assignment. This key point can go back to relieving stress. The more you know and understand about yourself, the more it informs how you approach and execute a task. 8. Sustaining effort and processing: This refers to how quickly your brain takes in information and makes sense of it. In a classroom when a teacher is lecturing and the student is trying to pay attention, they are taking in the information and deciding what to write for their notes and what they can let go of because they either already know it or it does not have enough importance. Processing is not a smooth endeavor for all students. All of these key points of executive functioning do not always work fluidly. Some students may thrive in some areas and struggle in others. Therefore, it is important to know what the student struggles with and work with them in those particular areas. The goal of educational therapy is to no longer need educational therapy. We want the students we work with to take everything we have taught and to continue on and thrive. One more thing that we often discuss when it comes to executive functioning is what the student is seeing at home. So for parents and teachers, be aware of how you are modeling all of these different aspects of executive functioning and if there is an area of weakness, acknowledge it. Having an awareness of strengths and challenges lets your child know that struggling in some areas is normal. Have your child read our blogs. Refer back to our second blog to get more information on how to calendar. Book a strategy session with us to discuss your particular needs… We are happy to help! It is so critical to understand executive functioning because EVERYTHING that has to do with “doing” life is impacted by executive functioning. 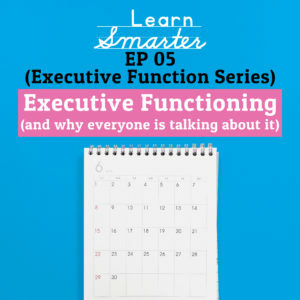 There are many different definitions of executive functioning (EF) and in this episode, Rachel & Steph discuss what executive functioning is in the context of educational therapy. They highlight 7 domains of executive functioning (organizing/planning/prioritizing, time, memory, motivation, stress management, self-knowledge/metacognition and sustaining effort/processing) that impact a person’s ability to function in school and life.